You know how you can get in one of those stupid arguments about what is tougher/better/etc with a good friend and not be able to let go... I got into one of them and need some help. Do any of you know of a pro cyclist who at any time in his life played competitive hockey? My hockey buddy had a list of reasons why hockey players are more "manly" than cyclists. I've refuted the rest but I'm looking for help here. the team manager mark olsen of bissel was a hockey player, now cat 1 or 2. speed skaters wear more lycra than cyclists and there are some of them that turned pro... well atleast one famous one. Dr Eric Heiden grew up playing hockey with some of the guys who ended up playing on the 1980 US Olympic hockey team. Pretty fair bicycle racer and speed skater, too. CCM made bicycles before they made hockey skates, if that is any help. 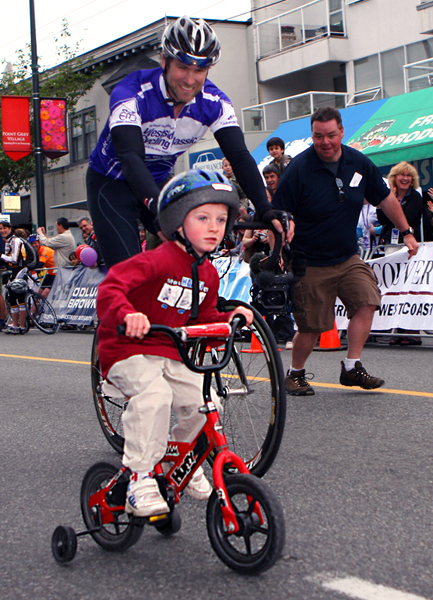 2 NHL players that do cycle include Eric Weinrich and Trevor Linden. I agree with your hockey buddy. Brent Burns of the MN Wild is an avid cyclist. He can't climb worth a darn though. Oh and your buddy is right. It isn't about being right or wrong. (Of course he is.) It is about arguing some absurd piece of information. Yup. The dude also has nice bikes too. That brings up a question. Do speed skaters or speed inline skaters wear underwear under their skinsuits? I'm trying to think of an outfit that would be more repulsive to my wife than bike shorts with no underwear, and at least skaters don't have a chamois or padding. I think it depends on how cold it is. Sometimes you need some windproof briefs to keep big johnny from freezing off. So probably yes for ice speed skaters and no for inline speed skaters. Thanks. Theo Bos and most of the Dutch Track Cycling Team used to be speed skaters. In fact Theo's brother is an Olympian too, but in speed skating. I'd be interested in knowing how many cyclists are former nordic skiers. Without a time limit, sure, they could do it. A 200 lb person who's optimized their body for 1-2 minute shifts? Doesn't take too much thinking to realize they'd be gone after the first HC climb. If you think about the type of training required for each sport, the cyclist would likely have a much easier time. Hmmm ...... I was a decent bike racer, play "beer league" hockey, and I used to speed skate. But this is such a "stupid argument" thing that I can't think of anything constructive to add ! Halve that ... two minutes is super long. just let your friend win, he is your friend, right?? 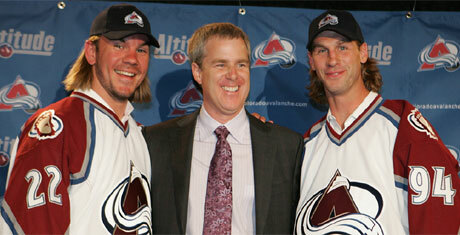 He said, "Hockey is more manly because hockey players wear more manly clothes than spandex." Cycling is more manly because when cyclists fall, they don't have any wussy pads or armor to help them. Just spandex. Hockey players don't shave their legs. Plus, they wear mullets. Yeah I was in a race with Trevor. Nice guy. I've played hockey my whole life and recently (last four years) took up cycling. I'd say you suffer more physically and psychologically in cycling. But does that make it "tougher"? In hockey a lot of the physical efforts are anaerobic. Most shifts if you're a forward and particularly centre are a series of sprints, often followed by serious collisions and jostling, sometimes roughing and even fighting. In cycling you hurt people without touching them; in hockey, it's just the opposite. Both are really tough sports, but it becomes a question of semantics: what do you mean by "tough"? I'd much rather be in a bar fight with my hockey team than my cycling team. But I'd also be willing to bet that not all my hockey buddies could pull through on a mountain time trial. I've met plenty of wimps playing hockey; they're on every team, and usually are the most talented players; their whole game centres around avoiding contact and 'not getting hit'. I think both sports are tough, really tough, because pain is part of both sports; it's unavoidable. The nature of the pain is different, though. And so if your friend associates toughness only with one kind of physical pain then you can't argue with him. It's more likely though -- and in hockey circles this is a ubiquitous truth -- toughness is literally equal to the ability to fight. I think that's stupid, but that's part of hockey culture. To me a tough guy is a guy who takes a cheap shot and uses that anger against the other team to score a goal or throw a crushing clean check. Throwing down the gloves and pummeling is what children do in the sandbox when they don't get their way. To return to semantics, to me toughness is the ability to tolerate pain and keep going. That is physical and psychological toughness. Both sports have that. If you can get your friend to accede to that point then you've won your argument. If he still doesn't believe it, then challenge him to a bike race around your block, a little crit. See what he thinks when he barfs up his dinner on the sidewalk. I'd be doing myself, and you guys, a disservice if I didn't ride the hell out of this thing!